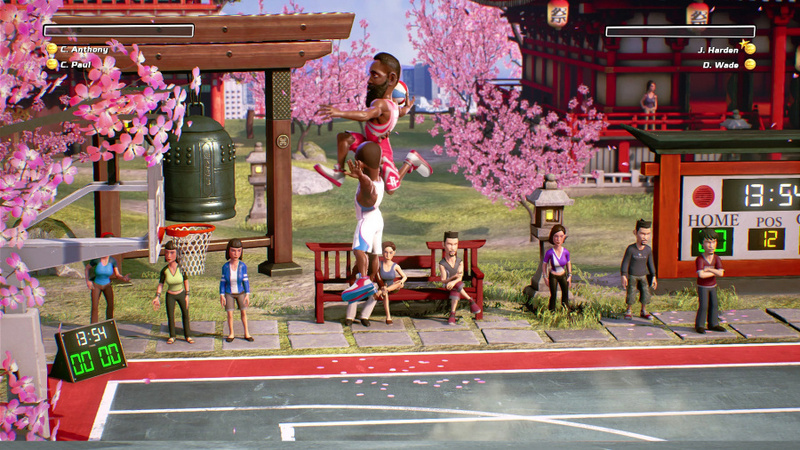 NBA Playgrounds has been a somewhat divisive game for the Nintendo Switch. On one hand, it’s offered an enjoyable local multiplayer arcade experience that showcases the strengths of the Switch quite well, but it also suffered a bit from offering less features than other versions and these features have been slow to arrive for the platform. Even so, there’s plenty to enjoy here, and Saber Interactive recently announced that even more is on the way. In a press release sent out earlier, it was revealed that the game has sold over 500,000 units across all platforms. How much of this was on the Switch is unknown, but that number has certainly spurred the developers on to keep supporting the game with new content. 33 new players are due to arrive by the end of the summer, along with various balance and quality of life tweaks to make the game more fun, and a new three-point contest mode for online play. Though it’s due out by the end of the summer, the content is coming to Switch at a later date, but hopefully the wait won’t be as long as it was for the online mode. What do you think? Do you like NBA Playgrounds? What else would you like to see added to the game? Drop us a comment in the section below. The first update took so long my interest turned to other games. Not even sure I'll get back to this now thanks to that. Splatoon 2 and Ever Oasis take the gaming cake for me for a while now. As someone that played a little basketball at college, I've always been tempted by this game. Has the resolution on hand-held been improved with the later update? I actually like the cartoon style of graphics and I prefer the lighthearted approach to a more serious game like NBA 2K. The mixed Switch reviews have always been enough to put me off. Is that pic from the Switch version? I actually noticed we finally had online play last week or so. About time, but with a promised copy of Shaq Fu to come to us early adopters, I'm not too upset by it. @Curlynob "Has the resolution on hand-held been improved with the later update?" @JJ286 "Is that pic from the Switch version?" Could be if it was on the TV, in portable the game has a blurry look but in the dock it looks great!! @Spoony_Tech The update makes the game 100% better. It has meters now to identify the sweet spot for shots (similar to mario golf). No more frustrating missed layups. @JJ286 that pic is definitely from PS4 or Xbox one. The characters don't have shadows in the switch version, much less the npcs. Such an ugly game. Why are they all turned into hobbits? What happened to the reduction in file size? Wasn't it supposed to half? Mine didn't unless I've missed something. Where at? Are you Curly Niel? @Priceless_Spork Lol. Unlike Neal I actually have (curly) hair! You guys forgot to mention that Switch owners will be getting Shaq Fu for free due to the wait on the other features. That more than makes up for it to me because they don't have to do that AT ALL.We would have just waited and accepted it as the usual on Nintendo systems. Yeah the last update made the game so much more fun, so bring on any further improvements I say! @JJ286 This is the Switch version. That looks like it's in 4k. Switch version might at least run at a buttery 60fps with those graphics. I actually have a decent interest in this game. I have been looking for some decent multiplayer games for Switch. The first update definitely improved things, but they still have work to do with regards to the graphics and especially the loading times. The latest version may be better, but it still takes too long to load games and to take the automatic in-bounds after a point is scored. Maybe some tweaks are also needed to stealing, because the computer seems to find it a lot easier to steal the ball from me than I do from it. Doesn't seem to matter if I use the legit steal button or the shove. @Freek Well according to Digital Foundry it squeaks by with a modest 20-22fps, it doesn't quite have the same temporal antialiasing and ambient occlusion had to be tempered slightly but essentially it's the same game. Thanks, made me laugh pretty hard. @Bustacap That's kind of what I thought. Two bad games for the price of one isn't really a deal. I'd be happy if they just fixed the resolution on handheld, or the load times. Then I'd be up for it. I held off on getting this until all the fixes were sorted , what are the specific switch issues still to be fixed, just the hanheld resolution? I grew up with MT Punch-Out! !, Baseball Stars and Temco Super Bowl, so this game is right up my alley. Great mix of old and current players and the gameplay is solid. Not a perfect game, but for $20, it's a steal (if you like arcadey sports games). The Graphics are nice. Really. The Loading time is big, but still enjoyable. I finished all tournaments before the major update (the online one), and it was only with 3 pointers. With the current balance of skills, probably it would be impossible to win with the same strategy (therefore, impossible to finish the game). But anyway, it's a funny game that it was worth buying. Here's a tip: Setup your match to finish when you score 10 points. You'll be able to raise your XP (and get new players) really fast. Meanwhile, the game still looks horrible undocked. I thought that was fixed in the last update? @Curlynob The game does look better in handheld mode then when first released. Is it 720p? That I'm not sure of but it doesn't look as blurry. @Spoony_Tech Cool. I'm tempted. Are you having fun with it? Do you think it was worth the money? @Curlynob I do think it's worth the money even more so now with the last update. For me it was worth it before the update. I was always interested in the game since release. But the free Shaq-Fu forced my hand to buy, and I don't regret it. And I was okay with the game pre-update. But Saber manager to salvage the throwing game and make this game a regular in my Switch rotation. I'm very pleased with the game, and excited to see more content is coming. The pic being Harden dunking over CP3 is funny when thinking about this offseason. I'm all for more players, jerseys, the new levels added are nice too, keep it coming. @Ps4all ohhh sad, well at least is a fun game I guess. I wonder if they made the heads too big that shadows couldn't be added to the Switch version. I'm sure that NBA 2K18 will have shadows and other better visuals. @WiltonRoots Ha! That screenshot is amazing! @JJ286 Yes, the game is a lot of fun. I have played through all the tournaments and then some. I have it on the switch and the Xbox one. Even though it is prettier on Xbox I like the switch version better because it is portable and I can pull the joycons off and my Pro controllers and my friends and I can play 4 player games together couch co-op anywhere. @Landlord I honestly think that the graphics come down to poor optimization. There's absolutely no reason for the long load times based on what the game does. Like they have needlessly over detailed character models, and rather than dropping the level of detail, they just turned off all of the effects and called it a day. Small things like the completely unnecessary delay on inbound passes really drag down the polish of the game. Even so, it's a pretty fun time, and I don't regret getting it, I just wish they'd spent more time on the smaller details. @Flammy I think the delay in inbound is not as bad as some say, imagine the CPU fast in bounding and running down and scoring at will without having time to setup your defense? Can you still get Shaq Fu if you buy the game just now? Kinda want it for the laughs. I'm looking forward to the update. It's not the best game out there, but I do enjoy arcade sports games (NBA Jam, NFL Blitz) when taking a break from sport sims. I really like NBA Playgrounds. Well at least the single player. The 3 times I played online so far the game ran so bad it was unplayable and actually disconnected. I will have to try again soon. But the game is loads of fun in single player and local multiplayer so far. @Ps4all yeah thats the awesome thing of the Switch, its portability. Nintendo nail it here!